Unique with its RTL-early organization, Vahid's text supports instructors wishing to develop strong design skills in their students. The emergence of parallel processing, multicore processors and FPGAs are blurring the lines between hardware and software and fundamentally altering the way digital design and design logic should be taught. Vahid's RTL-early approach better assists students in grasping the essential design fundamentals before digging into specific details of design optimization. 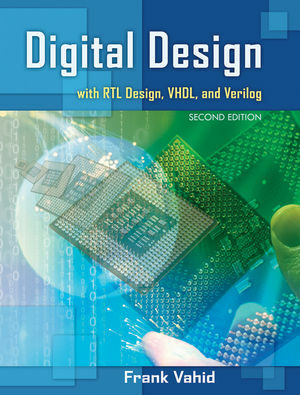 Frank Vahid is the author of Digital Design with RTL Design, VHDL, and Verilog, 2nd Edition, published by Wiley. Chapter 2 - Combinational Logic Design. Chapter 3 - Sequential Logic Design-Controllers. Chapter 4 - Datapath Components. Chapter 5 - Register-Transfer Level (RTL) Design. Chapter 6 - Optimizations and Tradeoffs. Chapter 7 - Physical Implementation. Chapter 8 - Programmable Processors. Chapter 9 - Hardware Description Languages. Appendix B: Additional Topics in Binary Number Systems. New robust book companion site for students and instructors. HDL supplements now available as print-on-demand or digital ebook.